What? You’re going again? Yep. We kicked off our fund-raising plea at our home church January 4, and I’m finally getting it posted online. Part of the delay has been my concentration on a new opportunity to serve and contribute to the ministry of PCM by becoming their webmaster. Isn’t it cool how God gives us interests and abilities and then positions us to be able to use them for Him? Anyway, here’s some info on our fifth journey back. There is nothing more powerful than prayer to open hearts and windows of opportunity. Pray for the Christian churches of Poland. Pray for Holocaust survivors who need healing, hope and eyes to recognize the Messiah. Pray for Ukrainian children whose lives can be changed by a week of camp. Pray for the ministry of Ostroda Camp. Pray to overcome any obstacle that could prevent us from serving. It costs a little over $9000 for the four of us to serve in Poland for a month – significantly more than our income as educators can provide. We are able to cover ground transportation, accommodations, food, and ministry expenses through careful year-round budgeting. But that won’t do us any good if we can’t get there. We need help to purchase our airfare. We ask that you prayerfully consider how much you could give to send us. A gift of any size will help us get there. 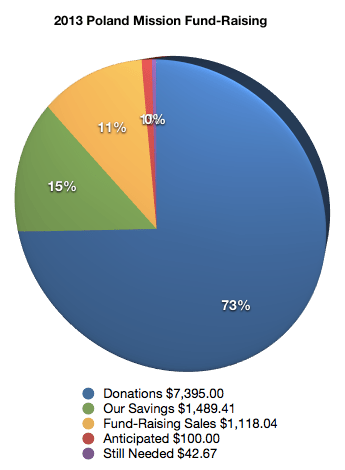 Here’s some math to help you see how you can contribute. You get the idea, any combination that totals close to $5060! Click here to go to our Financial Support page and learn more about how you can GIVE. Rachel is still making bracelets and other jewelry as a fund-raiser. They make excellent gifts or an accessory for yourself that will remind you to pray. Shop our Mission Store online or watch for details about the day the “store” will be open for purchases at Rockville Christian Church. This entry was posted in financial update, Preparing for the Journey and tagged financial, fund-raising, next trip, preparing, support.